NASHVILLE, Tenn. (August 2012) — More than 400 performing artists, music creators and industry representing all genres of music and will visit Nashville’s Music Row from Feb. 1-3, 2013 for the “LGBT Music Festival”. Performers and songwriters will take the stage along Demonbreun and Division streets from noon-midnight Friday-Sunday at entertainment venues such as the Music Row Best Western Lounge. The Music Row Best Western also will host music industry information tables, networking areas, and training sessions from 11 a.m.-6 p.m. Friday-Sunday. Attendees can receive hands-on advice, critiques and training in the Music Specialty Info Areas on topics such as Career Critique, Products Critique, Recording, Publishing, Plugging, Legal, Records, Duplication, Distribution, Radio, Video, Broadcasting, Shop, Management, Promotions, Publicity. Productions… LBGT educational partners will be on hand to answer your music biz and industry questions. The education portion of the event is hosted by the Independent Music Association. The “Valentines Carnival” will feature costumed dancing from 7 p.m.-midnight on Feb. 2, 2013 (Saturday) in the Music Row Best Western Lounge. Music creators can introduce their songs by performing scheduled or at “open mic” indoor stage locations in the vicinity and within walking distance located between Demonbreun and Division streets. The ‘LGTB Music Fest’ is a wonderful networking mixer and career-building opportunity for Lesbian, Gay, Bisexual and Transgender artists and songwriters from all levels of the music industry. More than 100 community industry/ volunteers will donate their time and resources to make this possible. Shows are open to the public. All festival badge holders are automatically registered to attend the Music Specialty Info Areas, scheduled to perform if desired, attend all parties and other fest functions. Do one or all at your own pace! Festival registration is $300 for three days, $200 for two days, and $125 for one day. The general public can enjoy three days of live music with a $50 armband. 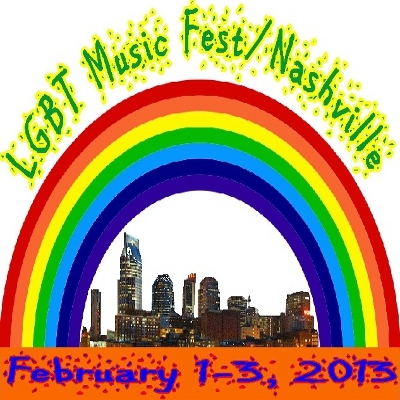 To register or for more information about the “LGBT Music Fest”, visit www.LGBTMusicFest.org , or send an email inquiry to info@LGBTMusicFest.org , or call (615) 424-1491.